Finding the right lighting for your home or business can be a struggle. From the thousands of lighting fixtures to more design options than we can count, modern lighting provides a wide range of choices to match every style and situation. When your renovation project becomes a burden, it helps to find a quality provider of commercial and residential lighting products. The Light Palace has proudly served as a go-to lighting store in Omaha, delivering expert advice and quality goods, for more than 50 years. If you’re in need of home lighting fixtures, our friendly and knowledgeable staff is more than happy to help! Today, we’ll continue our look into the versatility of sconces and their value when properly utilized in nearly every room in the house. These wall lights can provide the illumination you need, whether it be for ambient or accent lighting. When you’re ready, be sure to stop by our lighting showroom or browse our online catalog! Traveling from room to room generally means that you’ll be utilizing a hallway. Sconces can create a dramatic effect while contributing to the overall ambient lighting of your hallway. It’s important to choose the right spacing for your hallway, as installing too many or too few lights can drastically alter the finished product. Too many lights can become blinding, while not enough can contribute to tripping over unseen obstacles. One starting point for spacing out your wall lights is to alternate them at 8 foot intervals. This general tip may help, but it’s important to take other factors into consideration, such as the length of the hallway, the height of the ceilings, and the color of the walls. Our knowledgeable staff will be able to help you fine-tune the details to best match your desired outcome once all is done and that switch is flipped on. Many Americans enjoy the comfort of their dining room under a chandelier or some sort of pendant lighting. Finding the right fixture for this focal point in the room is crucial toward creating at atmosphere that is both comfortable and balanced. While the center display illuminates much of your dining area, the far corners of the room may be lacking in light. 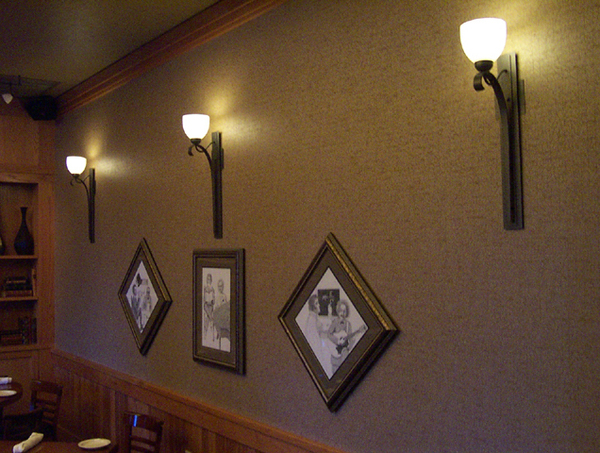 Sconces can prove perfect here, providing a gentle amount of light in a format that is non-invasive. Have a piece of art on your wall that you want to showcase during the meal? Place a sconce on other side to create a dramatic effect that illuminates bold lines and shadows to make a statement. Need an area in the dining room for paying the bills or reading your novel? Selectively placed sconces can provide the task lighting you need to get things done while enjoying the space more than ever. Procuring enough light for the stairs in your home or business is vital for promoting safety. The last thing you want to happen is for someone to fall because he or she could not see the steps clearly. Overhead lights may provide too little light, or worse yet, far too much in some cases. 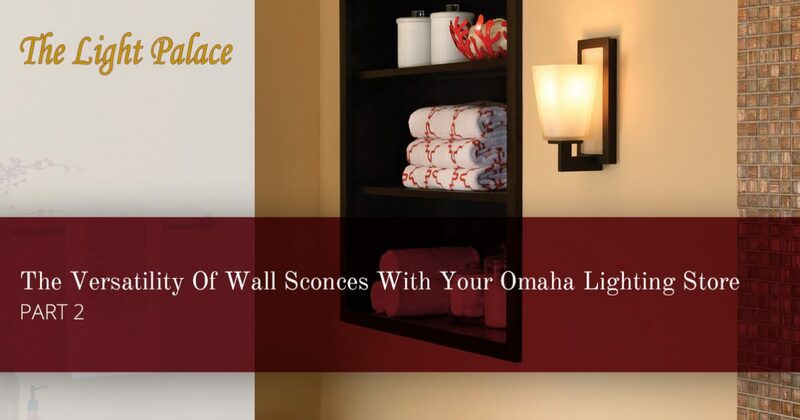 Wall lights such as sconces can prove ideal here, providing the perfect amount of light that is both convenient to install and easy to maintain. While your overhead light may be decent, it can prove to be more of a hassle once you’re on a ladder trying to change the bulb! Sconces are one method for creating dynamic lighting displays that work to optimize your outdoor and indoor lighting. These lighting fixtures are as versatile as they are stylish, and are very useful in taking your home lighting to the next level. When you’re looking for a lighting store in Omaha, be sure to stop by our grand showroom for assistance. The Light Palace is proud to serve Nebraska residents with lighting and home decor, providing a comprehensive inventory with expert advice. Contact us today to learn more or stop by our lighting showroom to get started! © 2017 The Lighting Palace | All Rights Reserved.